The epic sounds of summer continue as the Moonrise Festival featuring Diplo brings some of the best electronic and dance music in the world to Pimlico and Summerfest comes to Denton. Find out all of the details on our Summer of Music home page. Hit the beach in OC, ride the rapids at Adventure Sports Center International in Deep Creek, or hit new heights on the majestic Capital Wheel at National Harbor. There’s only so much time left in summer, and worlds of fun waiting for you in Maryland. Plan your Maryland family getaway now at VisitMaryland.org. 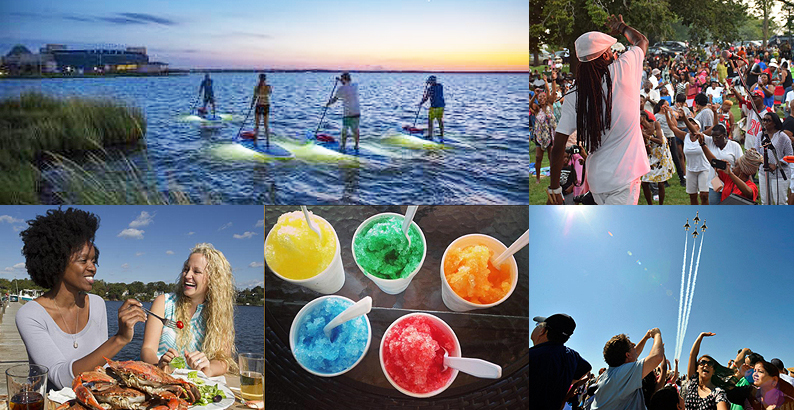 Whether it’s a BBQ bash or a seafood feast, summers in Maryland mean great eating, and we’ve got some great festivals lined up across the state to satisfy your hunger. Whether it’s the Smokin' on the Dock Chesapeake Bay BBQ Competition in Crisfield, the Pig Out in the Park BBQ Bash in Frostburg, the Chesapeake Crab, Wine and Beer Festival in National Harbor, or the amazing Seafood Feast-I-Val in Cambridge, it’s the perfect time to eat your way from the mountains to the sea. Find out more on our food festivals page. When it comes to beating the summer heat, no one does it better than Maryland. Whether it’s a traditional Baltimore-style snowball in Central Maryland, or a Western Maryland lollipop icy-ice cream treat when you’re out in the mountains, we’ve got cool on lockdown. Follow this link to find all about these sweet summer treats. The oldest multi-cultural, traditional arts celebration in the country begins its three-year run in Salisbury from September 7-9. Featuring more than 350 artists, a juried marketplace, dance, music and amazing food from all over the world, all on the banks of the beautiful Wicomico River, you won’t want to miss this amazing American tradition. Find out more including a list of performers and other activities on our National Folk Festival page. And the U.S., Canadian, and British Navies bring massive grey hulls to Baltimore Harbor as the U.S.A.F. Thunderbirds and a variety of other acts tear through the skies above over six days of can’t-miss thrilling fun. Plan your trip now on our Fleet Week page. Don’t miss your chance at free tickets for amazing events across the state. Every Monday on Instagram, Facebook and Twitter, the Maryland Office of Tourism is joining with our sponsors to give away great Maryland travel experiences. We call them Maryland Mondays, but you can enter all week. This week you’ve got two chances to win either a pair of tickets to see the incomparable Bill Burr at MGM National Harbor, or a Family 4-Pack to Six Flags America. Follow us on Instagram, Facebook, and Twitter to enter.